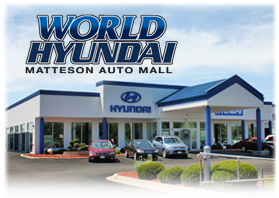 World Hyundai in the Matteson Auto Mall is celebrating 7 years in business serving the Village of Matteson and the surrounding community! We want to thank all of our customers who have visited us over the years, purchased vehicles, had their vehicle serviced in our Hyundai service department as well as to the many local shops and dealers that purchase Hyundai parts and accessories from our dealership. Our success is because of you! We have many new and used vehicles specials as well as service specials happening right now at World Hyundai! Stop by the dealership and get a great deal on any vehicle in stock!